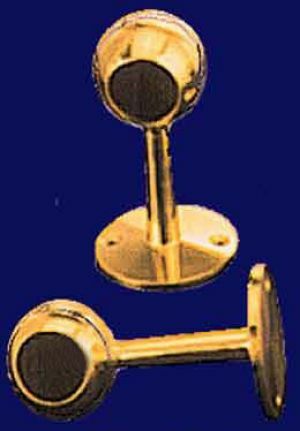 A favorite in boats and RVs because it's solid brass. 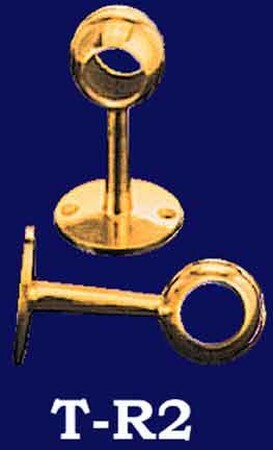 This curtain end can be used with any 1" diameter tubing. Sold by each. To use for holding a curtain or towel rod, order two. For longer lengths, use our T-R2 connecting support (lower support in photo). The T-R2 hole is drilled all the way through, so it can be slid to the middle of the rod for extra support. Order our complete rod set in 24", 36", or 48" width, or replace old brass rods with our rod-only products. Measurements: Projects 3 7/8" from the wall. The circular backplate is 2 1/8" in diameter, and a sturdy 5/32" thick. This item accommodates 1" diameter rods.